Leaders Manchester City might have been knocked off the top of the table by the time they play Chelsea at tea-time on Saturday in the pick of the weekend fixtures. But BBC Sport’s football expert Mark Lawrenson thinks they will get a win at Stamford Bridge that will put them back on the Premier League summit. “Chelsea have lost their past two away games, at Tottenham and Wolves, and there are one or two cracks starting to appear,” Lawro explained. 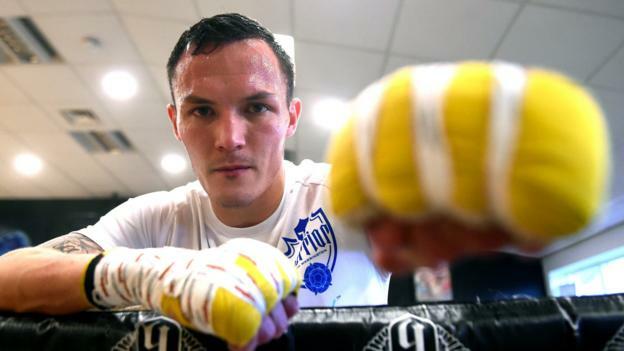 This week’s guest is boxer Josh Warrington, the IBF world featherweight champion. Warrington is a Leeds United fan – and chairman of their supporters club – who became the first boxer from his home city to win a world crown when he beat Lee Selby at Elland Road in May. He defends his title against Carl Frampton in Manchester on 22 December, but has been keeping a close eye on how Marcelo Bielsa’s side are doing in the race for promotion from the Championship. “He has brought a good buzz back to Elland Road,” Warrington told BBC Sport. “We have been entertaining to watch and it is a good place to be at the moment. “Whatever has happened in games, even if we are behind in stoppage time at the end of the game, there is still a belief that we can win. “The one thing with Leeds fans is that they always want to see the team just have a go and it seems he has changed the mentality of all the players, and he is bringing the best out of them. This is a big week for Liverpool, who must win their Champions League group game against Napoli on Tuesday to reach the last 16. They can start it by going top of the Premier League if they beat Bournemouth – but only Manchester United and Arsenal have won at Vitality Stadium this season, and neither of them found it particularly straightforward. Reds boss Jurgen Klopp made some very brave changes in Wednesday’s win at Burnley, starting the game without any of Roberto Firmino, Sadio Mane or Mohamed Salah up front. When they went 1-0 down at Turf Moor, I was thinking ‘this is going to be interesting’ but they responded in the right way. Whatever line-up Klopp goes with this time, this will be a test. Some of Liverpool’s recent performances have been ordinary, while Bournemouth have been great this season, and returned to winning ways against Huddersfield on Tuesday after losing four in a row. The Cherries play good football and are easy on the eye, but they are not a soft touch – and Liverpool will have to play well to beat them. I am still really encouraged by Liverpool’s season so far, though – their performances have not been great but, in the Premier League, their results have been. In the Champions League, if Klopp’s side had beaten Red Star in Belgrade – and I know it is is a big if – they would be virtually through to the knockout stage already and we would be looking at them in a different light. They have not been playing well as a team, but I think what they have done so far is really positive, because I am thinking ‘wow, what will they do if they really get going?’. Arsenal had a tough game against Manchester United on Wednesday night but they have got a decent-sized squad so I don’t see that being an issue here. I just can’t see a situation where Huddersfield can go to Emirates Stadium and win. This game is not totally inconsequential when it comes to the Terriers’ survival hopes, but it will not be a game they will expect to get any points from and, if they do, it will be an absolute bonus. Liverpool boss Jurgen Klopp was not happy about them, but the tackles that Burnley put in against the Reds on Wednesday night were legal, and they are the kind of thing the Clarets need. Sean Dyche’s side have been too nice to play against this season, so it was nice to see them snarling again – even if they did end up losing the game. I think Burnley will need a phase of that if they are going to climb out of trouble, starting with the visit of Brighton. The Seagulls had a great result on Tuesday with their derby win against Crystal Palace and they seem a lot stronger than last season, not least in the way they seem to be able to pick themselves up after a bad result. New Southampton boss Ralph Hasenhuttl was in the stands to see his new side get comprehensively beaten by Tottenham on Wednesday night, and it will be interesting to see what team he picks after spending so little time with his players. Hasenhuttl will get a reaction, because suddenly everyone is playing for their place now Mark Hughes has left. But I don’t think he will know too much about Cardiff, and I am pretty sure he won’t have crossed paths with Bluebirds boss Neil Warnock before. So this is a case of ‘welcome to the Premier League’ for Hasenhuttl and this is going to be a tough test for him. Cardiff have won three of their last four home games, and I can see them getting another victory here. I am covering this game for BBC Radio 5 live and wondering whether there will be anything different about Manchester United this time. At the moment it is the same story every week. United have a few issues with their manager and with different areas of their team but the bottom line is that they just cannot seem to win a game – Wednesday’s draw with Arsenal was their fourth league game in a row without a victory. Surely that has to change at home to the Premier League’s bottom club, even taking into consideration that Fulham have improved under Claudio Ranieri. Things have been pretty bad at Old Trafford for a while, but anything but a win would really underline where United are at the moment, and how far they are off the top four. My manager is a United fan and I often check the scores or watch Match of the Day then phone him up to give him some stick. It has been quite sweet to see United struggling but I am hoping next season is the start of Leeds playing them again as a regular fixture. West Ham have had back-to-back wins over Newcastle and Cardiff and they are starting to look far more like a team, although Marko Arnautovic’s hamstring injury is a blow. Crystal Palace will have a point to prove after being beaten by Brighton last time out, but I am going for another Hammers win here. Chelsea made a fabulous start to the season but I have never seen them as genuine contenders in the title race. This has become an even tougher game for Blues boss Maurizio Sarri with his side losing two of their past three away games, and I am going for a City win here. Away from the Champions League, very few teams have really tested City this season – Liverpool gave them a good game at Anfield and they drew at Wolves, but Wolves’ goal should never have been allowed anyway. So it is going to be interesting to see how close Chelsea get to them, and whether they can make life difficult for the champions at all. I really do have my doubts. It has been a while since Leicester last lost – a run of seven games since they were beaten at Arsenal on 22 October. Finishing in the top four and being in the Champions League in Spurs’ first season in their new home will be even more important than getting out of their group this time. Wolves have had a wobble but I wonder if they have turned a corner after their fightback to beat Chelsea on Wednesday. Newcastle picked up a good point at Everton on the same night, to get back on track a bit after their home defeat by West Ham at the weekend. Apart from that result against the Hammers, Newcastle have been in decent form for the past few weeks, and I think they will get another draw here. This is Marco Silva’s current club versus Marco Silva’s former club. I would imagine it will be competitive on the pitch and maybe in the boardroom too, bearing in mind Watford were unhappy with Everton’s initial approach for him last year. In terms of the game, the Toffees are only three points above the Hornets in the table, but in much better form. Watford, who did not win in November, are yet to win in December, but have been competitive when I have seen them, even though they have taken only one point from their past five matches. I don’t see them getting anything here either, however. From the midweek Premier League games, Lawro got six correct results, including one perfect score from 10 matches, for a total of 90 points. He was beaten by The 1975 bassist Ross MacDonald, who got eight correct results, including two exact scores, for a total of 140 points that sends him to the top of the guest leaderboard.